Walk into any classroom at Langley, and you’ll see students of all ages using technology to enhance learning. From laptops and iPads to Smartboards and videoconferencing, students and faculty have access to wonderful tools and resources. But it’s not about the technology – it’s about the learning. Our goal is for students to see technology as another tool in their learning tool bag. When integrated seamlessly into all aspects of the curriculum, technology can provide opportunities for students that otherwise would be impossible. Using videos, pictures, and audio recordings, for example, students can express themselves in unique ways and communicate with people around the world…the possibilities are endless. So what are some of the new technologies our teachers are incorporating into the classroom? Langley kindergartners recently started using “Draw and Tell,” a powerful, kid-friendly iPad app for storytelling that allows them to create a picture and record themselves telling a story. As kindergarteners love telling stories, but may have difficulty writing out long sentences, they have really enjoyed this app. The excitement on their faces when they create their very own story is priceless. Do you remember studying explorers as a kid? I bet you didn’t learn about an explorer by making a voice recording talking about various facts and interesting details of the explorer’s life, like Langley’s third-graders did. These audio recordings were turned into QR codes which were placed on life-sized cutouts of each explorer, making it easy for others to scan and listen to these informative student recordings. It was amazing to see how engaged and eager to write scripts the students were. By using technology, they were able to present their learning to the community in a more personal (and fun!) way. 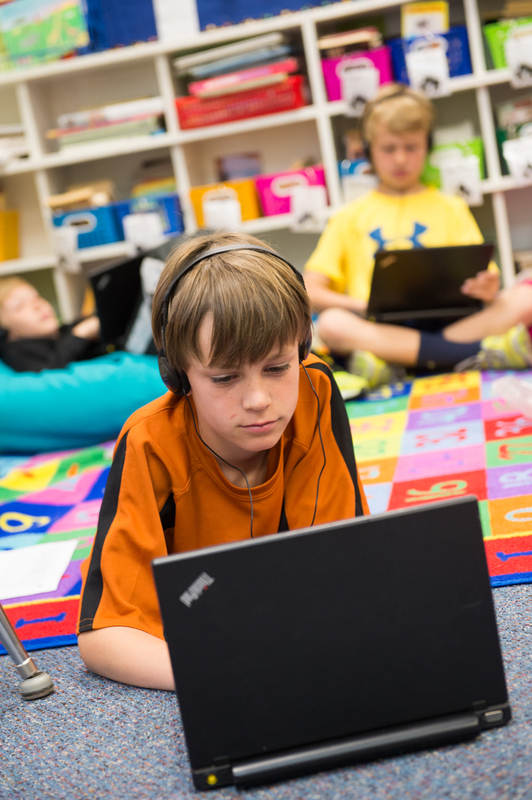 Students use technology not only as part of their daily life and lessons, but also as a way to connect to the world outside Langley. Through the use of a blog, our second-graders connected with their Massachusetts pen pals. Students “met” for the first time with a “Mystery Skype” session, where the two classes participated in a videoconference and had to guess where the other was located, using only yes or no questions. This Skype session allowed the students to get to know each other a little bit, and sparked their interest to continue the conversation on their blogs. Having an authentic audience has motivated the students to write with more detail and to utilize their writing skills, as well as practice how to be responsible digital citizens and communicate online. Technology in the Primary and Lower Schools is woven through the curriculum, which is exactly what you will see in the Middle School. It would be hard to find a Middle School student walking around campus without his or her iPad in hand. The 1:1 iPad program for grades 6-8 has changed the way students and teachers communicate. Many classes use Web tools like Google Drive and Edu 2.0 to take quizzes, have discussions online, and submit assignments. These tools allow every student to have a voice and receive immediate feedback. Our Middle Schoolers are also frequently seen in hallways and scattered around classrooms, making videos, taking pictures, and recording audio. They are fully engaged and having…dare I say, fun? Plus, they are clearly learning critical life skills like problem solving and collaborating with their peers. Technology is a central part of the learning experience here at Langley. By incorporating a wide variety of tools into each subject area, we are not only teaching our students valuable skills, but also making the learning process fun, dynamic, and interactive. I can’t wait to see how technology will continue to shape the way we interact with our students and impact our ability to teach lessons in new and exciting ways. This entry was posted in By Emily O’Grady, Technology and tagged app, blogs, Edu 2.0, Google, Google Drive, iPad, Langley, laptops, Skype, Smartboards, technology, videoconferencing, voice recording by langleyleopards. Bookmark the permalink. It is wonderful to read about the high level of technology that is being used for the education of all the children at Langley. I am so proud of what Scarlett is learning and bringing home to demonstrate to the family. She has told me of the “story writing” that she is doing. It is exciting for her.